Suzanne McConnell holds a BA in Sociology from the University of Arkansas and an MFA in Fiction Writing from the Iowa Writers’ Workshop. 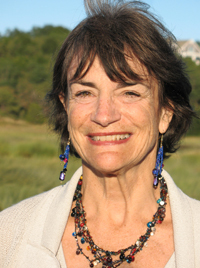 Twice nominated for the Pushcart Prize, her stories, essays, and poems have appeared in such publications as The Huffington Post, Provincetown Arts, The Brooklyn Rail, The Waterstone Review, Per Contra, The Hamilton Stone Review, The Saint Ann’s Review, Bellevue Literary Review, Calyx, Kalliope, Green Mountains Review, The Fiddlehead, Personal Fiction Writing, Earth’s Daughters, A Sense of Place, and Poets & Writers. She has been granted residencies at Ucross Foundation, Dorland Mountain Arts Colony, and Villa Montalvo Center for the Arts. She taught writing and literature at Hunter College for thirty years, was the Scholar/Facilitator for New Jersey’s Literature and Medicine programs at the University of Medicine and Dentistry and at the Department of Veteran Affairs for six, and has been an editor and writing coach for Greenline Publishing Consultants as well as free-lance. Since 2006 she has been Fiction Editor for the Bellevue Literary Review. Her stories have won First Prize in the New Ohio Review’s Fiction Contest, First Prize in Prime Number Magazine’s Flash Fiction Contest, and an excerpt from her novel, Fence of Earth, won Second Prize in So To Speak‘s Fiction Contest and was a finalist for the James Fellowship for Novel in Progress. Her forthcoming book about Kurt Vonnegut’s advice on writing, Pity the Reader: On Writing with Style by Kurt Vonnegut and Suzanne McConnell, will be published as an e-book by Rosetta Books and in hard cover by Seven Stories Press in November, 2019. She grew up in San Diego, attending Grossmont High School and San Diego State College. She lives in New York City and Wellfleet, Massachusetts with her husband, a sculptor, Gary Kuehn.